If you’re asking yourself where you can see authentic Flamenco in Seville, then this post is exactly what you need. You will find a list of the best places in the Andalusian capital city where to ignite the most typical Andalusian passion. Because Andalucia is the cradle of Flamenco, it will inspire you with the most picturesque tablaos and peñas where you will be overwhelmed with the sings and dances that are so typical of this Spanish region. The discipline of Flamenco can be divided into music and dances. Speaking of music, both songs and the guitar play a fundamental role and they are accompanied by percussion instruments and clapping in time. The Flamenco songs are called “palo”. Nowadays, there are more than 50 “palos” grouped according to their origin, metrics, and accompaniment (by guitar or dances). However, all the palos follow the same structure, composed of a fixed and a variable part, the latter giving space for improvisation. The most typical “palos” are alegrías, bulerías, fandangos, seguiriyas, sevillanas, soleares and tangos, and they differ for the lyrics, the verses and the rhythm. Tip: there are various kinds of places where you can enjoy Flamenco. Tablao: the tablaos are where the Flamenco is showcased most professionally. The shows are held in theatres or clubs, which also offer drinks and dinner (usually included in the price). Cultural centre: the rarest places, usually near museums where a smaller audience is to be found. They don’t normally offer food nor drinks. Located in the central district of Santa Cruz, this tablao was inaugurated in 1996 and, since then, it’s one of the most famous places to see Flamenco in Seville, thanks to the famed artists who’ve been performing here, such as dancer Rafael Campallo, singer Juanfran Carrasco and guitarist José Pérez. 1-hour-and-a-half shows with 10 artists take place daily (at 8.30 pm and 10.30 pm). 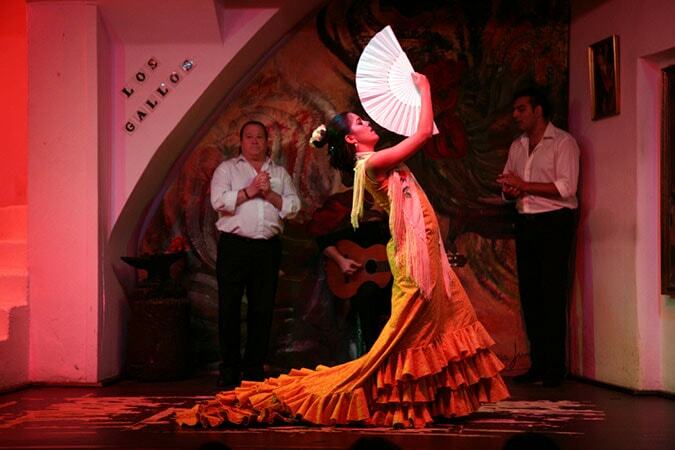 As its capacity is limited to 120 people, you should book your ticket to guarantee yourself the chance of enjoying a Flamenco show at Tablao Los Gallos. 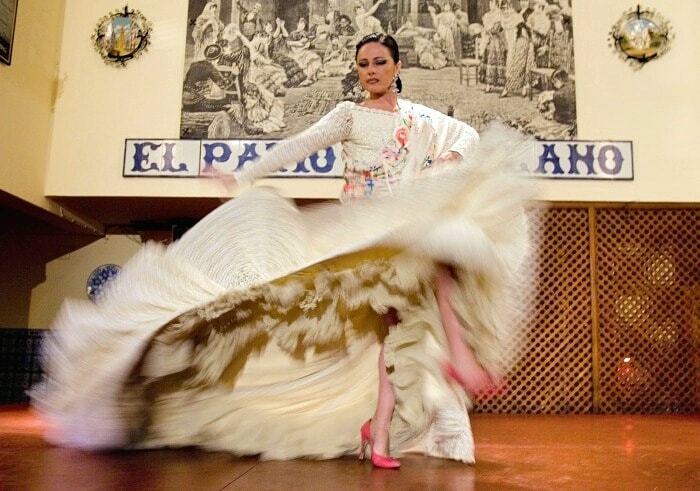 This tablao lies in the historic centre of Seville, in El Arenal district. Bailador Curro Vélez founded it in 1975. Here, you will find an authentic ambience soaked in the true atmosphere of Flamenco; besides, you can even taste the delicious delicacies of Andalucia, which you can choose between tapas or a menu. Booking in advance is available for show + dinner. Shows are at 7.30 pm and 9.30 pm. 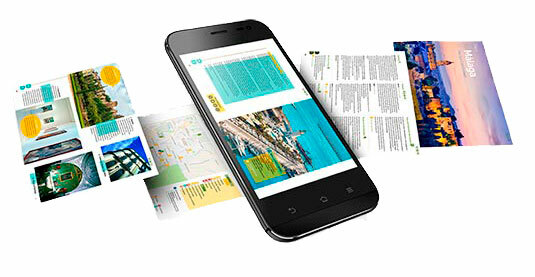 Click here to choose the date, hour and type of reservation. 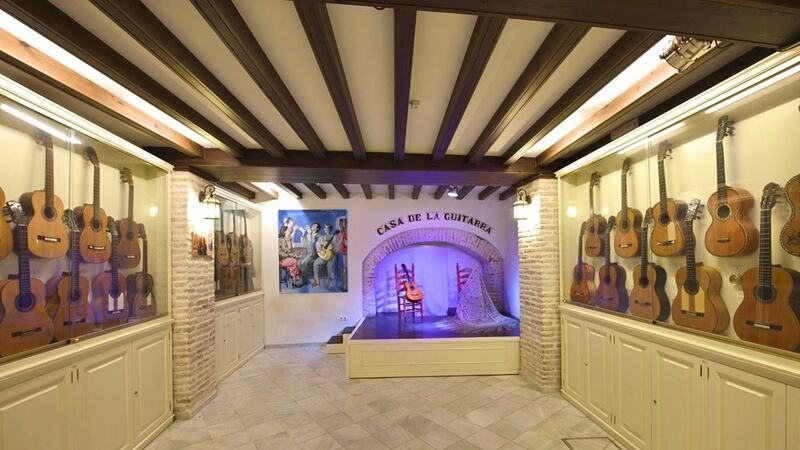 The Casa de la Guitarra is a Flamenco-related cultural centre located in an 18th-century building. It’s run by José Luis Postigo, a Flamenco artist who’s been awarded the Premio Nacional de Córdoba and the Premio Nacional de la Catédra de Flamencología de Jerez de la Frontera (two prestigious awards in the world of the Flamenco guitar). While here, you will also have the chance of visiting the Museo de la Guitarra de Sevilla for free (Seville’s Museum of Guitar). Here, a unique collection of more than 60 Spanish guitars belonging to the past three centuries is displayed. 1-hour shows take place daily at 7.30 pm and 9 pm. Click here to choose the date, hour and number of people. If you want to enjoy a typical Flamenco atmosphere, a reading club and tapas, then this old coal warehouse in Santa Cruz district will satisfy your needs. Because there is no outdoor signal indicating what La Carbonería is, this is a great opportunity to enjoy the most authentic Flamenco experience. You can enjoy the purest essence of Flamenco at this tablao, which has even been chosen to promote Flamenco on an international level by TVE (Spain’s main Television Channel). The shows’ artistic director is Emilio Ramírez, known as “El Duende”. The palace is composed of various halls, and it also welcomes the Bodega Museo on the ground floor, where the Museo del Flamenco y Arte Andaluz is located (Museum of Flamenco and Andalusian Art). The visit to this museum is free, which displays photos, garments belonging to the artists that perform on the tablao, and pieces related to the Andalusian culture, such as the equestrian practice and wine. 1-hour-and-a-half shows take place daily at 7 pm and 9.30 pm. Click here to book. Here you will find one of the most interactive Flamenco experiences, in a peculiar tablao set in a 19th-century building, whose precious and colourful tiles provide the most splendid ambience to enjoy Flamenco. Tip: stay after the show ends, as you will be provided with a 20-minute Flamenco masterclass. 1-hour shows take place daily at 7 pm and 8.30 pm. Click here to book. Located next to the Bullring La Maestranza, in front of the Triana district, the Patio Sevillano has been welcoming famous artists’ performances such as Cristina Hoyos and Chano Lobato. You can attend Flamenco shows, ask for private Flamenco-themed parties, enjoy 20-minute Flamenco workshops and 1-hour masterclasses by sending an email to booking@elpatiosevillano.com. 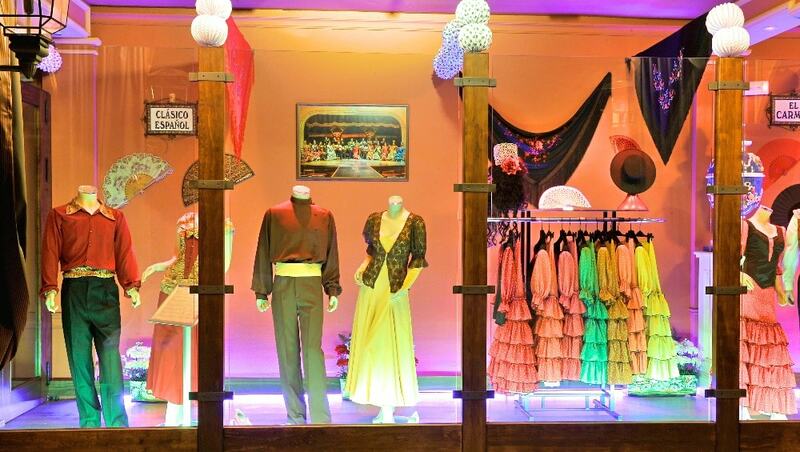 This museum offers a 360-degree experience to all Flamenco lovers that happen to be in Seville. It features a three-floor building with interactive displays, temporary exhibitions and VIP shows and private Flamenco masterclasses in the basement. Guided tours are offered in English, Spanish, German, French, Italian, Korean, Chinese and Japanese. The museum, run by Flamenco legend Cristina Hoyos, is open 10 am – 7 pm, Monday to Sunday. Shows take place daily at 5 pm, 7 pm, 8.45 pm and 10.15 pm. Click here to book. If you want to enjoy a private Flamenco show, head to this tablao in the spectacular neighbourhood of Triana. You will find a private hall, characterised by Mudejar architecture and parts of the Moroccan pavillon of the 1992 World Exhibition of Seville, where up to 50 people can enjoy a 4-artist Flamenco show. Head to their Trip Advisor page to see the 5-star reviews other people have left. Shows take place from Thursday to Sunday, at 8.30 pm and 10.30 pm. Click here to book. This tablao is set in the heart of the Andalusian capital city, in an authentic environment that helps you connect with the purest Flamenco atmosphere. The peculiarity of the Tablao Flamenco La Cantaora is that the “festero” is present, a complete artist that sings and dances as they interpret 19th-century palos. Check their website to know all the promos provided to let you enjoy Flamenco as never before. Shows take place daily at 9 pm. Click here to book. This Tablao is located on the riverbanks of Guadalquivir, in the authentic district of Triana. 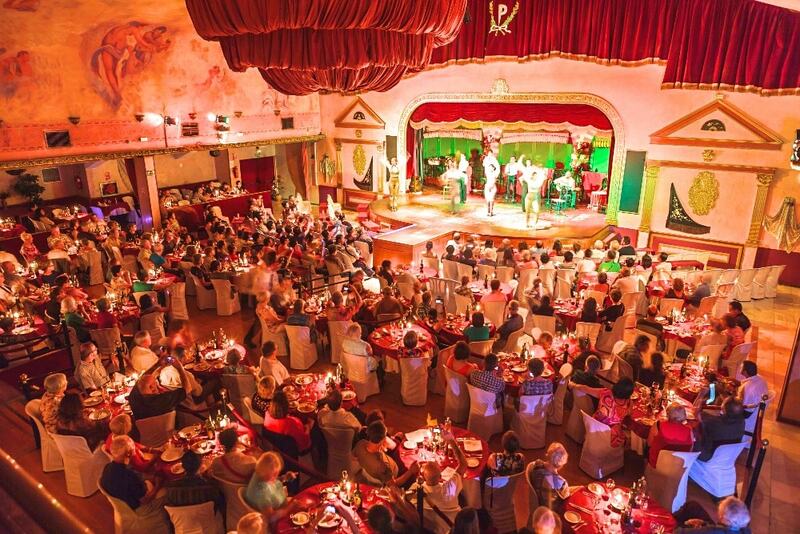 When here, you will be able to enjoy Flamenco firsthand and, by arriving 20 minutes before the start of the show, you can also enjoy a glass of Manzanilla wine, typical of Sanlúcar de Barrameda. Also, you can take pictures with the artists once the show has ended. Shows take place everyday at 8 pm. Click here to book your tickets. Last but not least, Seville welcomes a Flamenco festival once every two years since 1979. 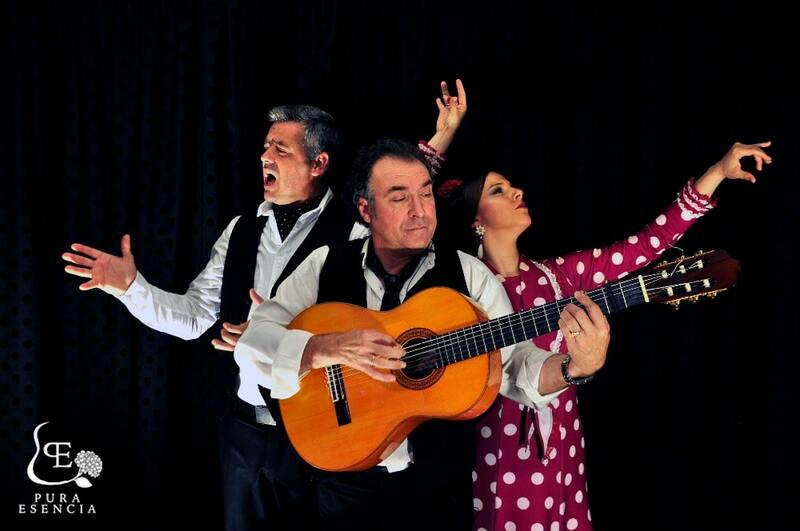 The Bienal de Flamenco welcomes famous bailadores, cantadores and guitarristas. In 2020, the 21th Bienal is taking place from September 4th to October 4th. You can book your tickets by visiting this webpage and choose the day and show you wish to attend. Relax in the most splendid villas near Seville and make the most of authentic Flamenco shows in the capital city of Andalucia. Click on the button below to discover which holiday homes and villas you should be renting out right now! Which is your favourite place to see Flamenco in Seville? Tell us in the comments below, and don’t forget to rate this post!